Liverpool and Man City go head to head in the UEFA Champions League quarter-finals, with the Reds hoping to make home advantage count at Anfield Road. 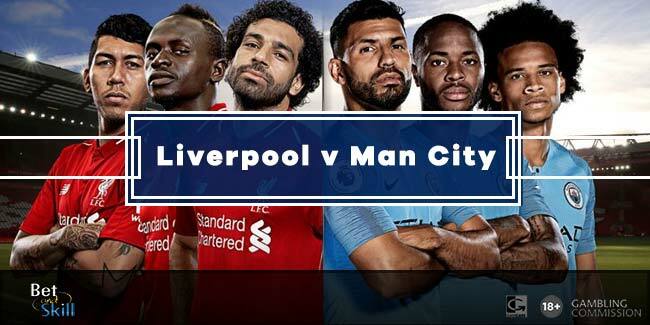 Check out here our Liverpool vs Manchester City betting preview with predictions, betting tips, probable lineups, team news, enhanced odds, bookie free bets and no deposit free bets on this week's Champions League matches! Get 40/1 Liverpool or 30/1 Manchester City to win at Betfair! New Customers can get Liverpool at an enhanced 40/1 to beat Man City or 30/1 Man City to win. Max Stake £1. Winnings paid in free bets, valid for 7 days, only deposits with cards/Paypal count. Exchange and multiple bets excluded. T&C’s Apply. 18+|Gamble Aware. Liverpool came from behind to beat Crystal Palace 2-1 at Selhurst Park on Saturday. They are in third spot in the Premier League table, unbeaten at home in the league with 10 wins and 6 draws scoring 38 goals and conceding 10. The Reds qualified for the UCL quarter finals by comfortably eliminating FC Porto. Klopp’s side romped to a 5-0 win in Portugal before managing a goalless draw at home in the return match. Other Champions League home fixtures saw the Reds securing a draw with Sevilla (2-2) and wins over Maribor (3-0) and Spartak Moscow (7-0) in the group stage. Joel Matip is set to undergo thigh surgery and will likely miss the rest of the season. As a result, Virgil Van Dijk will be partnered by Dejan Lovren at the heart of the back. Adam Lallana has joined Joe Gomez on the sidelines after suffering a hamstring injury at the weekend while Emre Can is a doubt. Gomez’s absence and the fact that Nathaniel Clyne is yet to play this season could see Klopp drop his preference for rotating his right-backs and stick with Trent Alexander-Arnold. Manchester City warmed up for Wednesday with the easiest of 3-1 victories at Everton. They mantain a 16 point commanding lead over 2nd placed Manchester United in the Premier League table. The Citizens also put their Round of 16 meeting with FC Basel to bed with victory away from home in the first leg (4-0) before to suffer a shocking loss in the reverse match at the Etihad Stadium (1-2). As to direct encounters, Manchester City thrashed Liverpool 5-0 at the Etihad Stadium back in September but the Reds became the first English club to beat Guardiola's men this season with the 4-3 win at Anfield in January. Furthermore, The Citizens have won none and lost 11 of their last 16 visits to Anfield. Pep Guardiola is hopeful Sergio Aguero has recovered from a knee problem, while Aymeric Laporte suffered a foot injury at the end of Saturday's match but he will push to make an immediate return here. John Stones and Fabian Delph also are both for this game, but will probably be available, while long-term absentee Benjamin Mendy is still sidelined with his knee injury. Leroy Sanè and Raheem Sterling are both expected to keep their starting berth in the front trio, as well as the likes of Kevin De Bruyne, Fernandinho and David Silva in midfield. 25/1 ANY Yellow Card in Liverpool v Man City! Ladbrokes offer 25/1 a Yellow Card to be shown in Liverpool vs Manchester City + £5 free bet! BetAndSkill compare prices from more than 70 top betting sites to provide you with the highest odds on all the matches we analyse. The section below contains the highest odds on the Liverpool vs Manchester City match winner market (90 minutes only)! Are you looking for boosted odds? Visit our Today's enhanced offers section! Our expert tipsters have analysed all the betting factors (recentform, lineups, motivations, team news, etc..) and came out with the following recommended bets on Liverpool vs Man City. Feel free to copy our recommended bets and back them on at the highest odds available by clicking the 'Bet' button! You can also combine many or all of them using on of our recommended Request a Bet services. "Liverpool vs Man City betting tips, predictions, lineups and free bets (Champions League - 4.4.2018)"